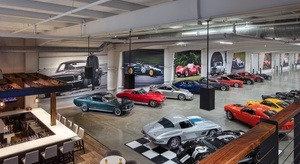 SWEET project! 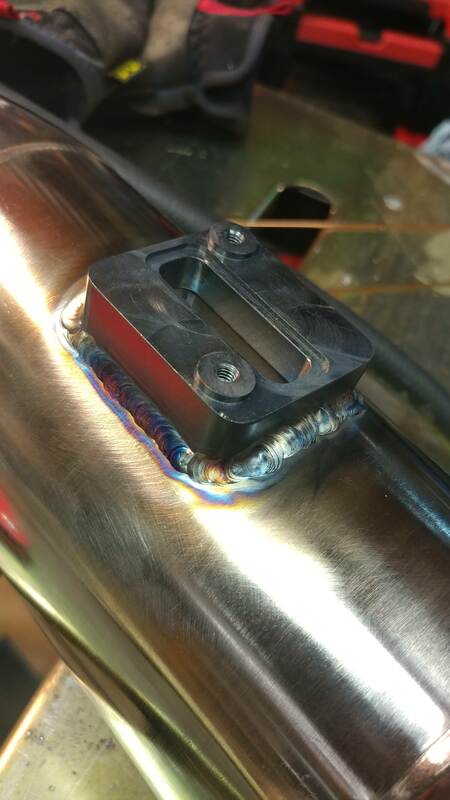 Those little flange weld nuts are super handy for any project. 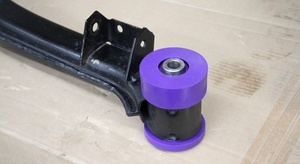 Great for mounting brake lines, fuel lines, light-duty brackets, etc. Nice work so far, I am a fan. You're making me motivated to get back out and work on my Courier! Thank you all for the kind words. I think it's awesome there's a lot of guys on here that appreciate the little things in life... like minitrucks. 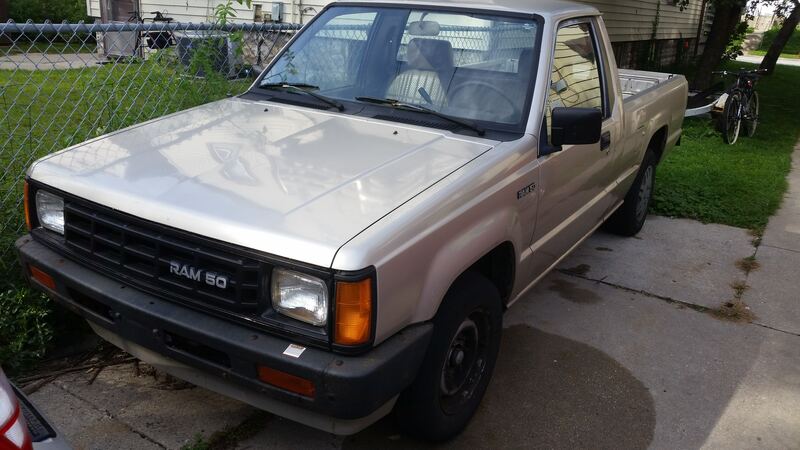 80 d50, first vehicle I drove. 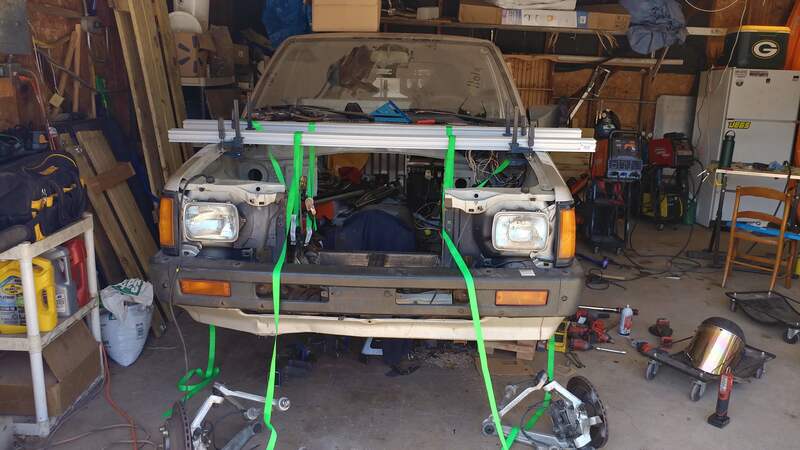 Not legally... looks like an awesome project! Update time boys. 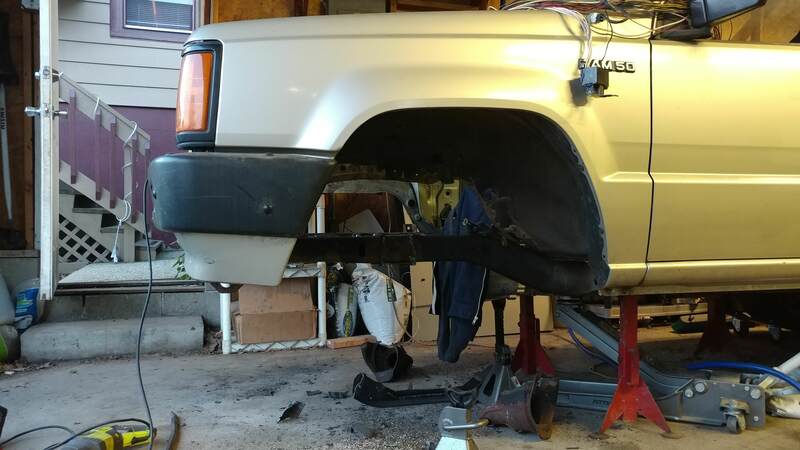 I spent far too long one night this week trying to wrestle the leaf spring out of the front suspension so I could try and cram the subframe under the truck without lifting the truck anymore. This task turned out to be more than I bargained for on a Tuesday night. 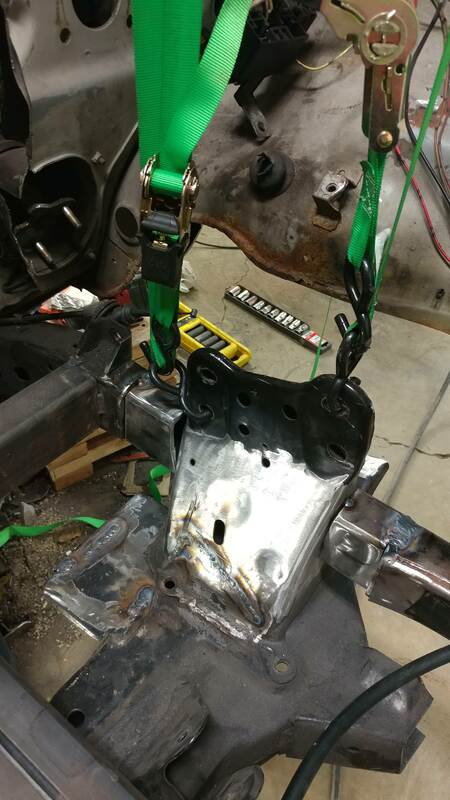 I had to separate a couple ball joints and pull the lower control arm off of one side of the cradle to release enough pressure off the spring to wiggle it out. 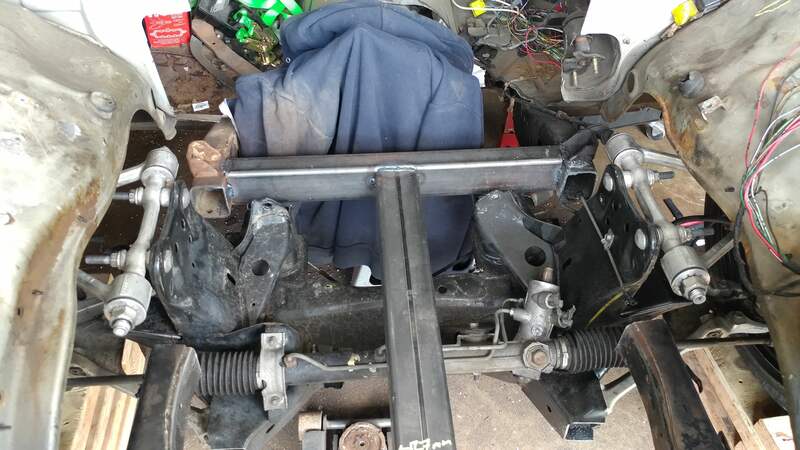 Three hours later the spring was removed, the right side was reattached and I managed to half stuff the front subframe in close proximity to it's new home. 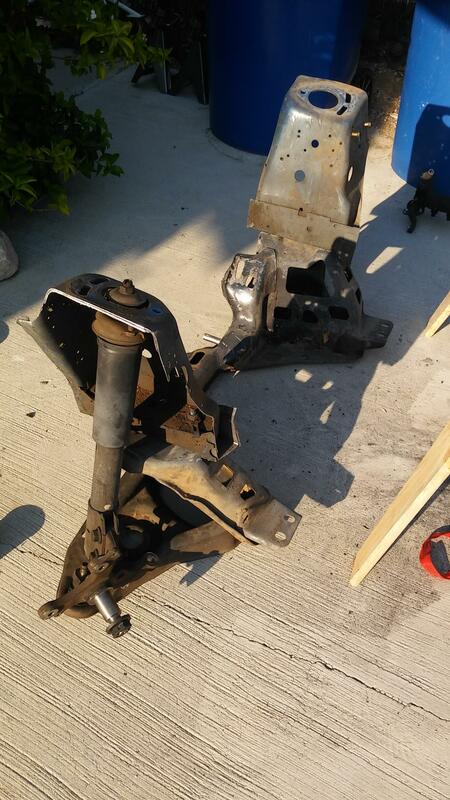 The factory upper arm mounts, shock towers and the remaining front cross member were all in the way and had to go. Enter my new favorite tool. I don't like yellow, I really don't like yellow tools, but it matches my roommate's air compressor and it worked right out of the box which is way more than I anticipated out of this Chinese Harbinger of Destruction. It's effective at removing body hair and cuts way better than I expected out of it. 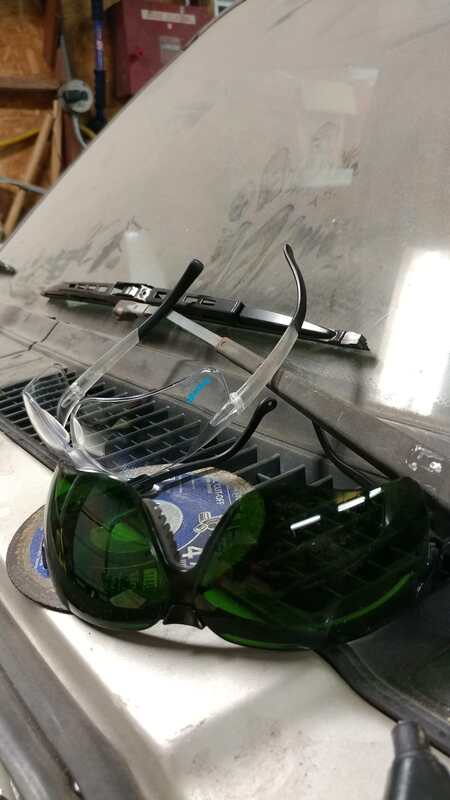 Found a pair of forge glasses from when I used to work in investment casting. These are about a #3 welding shade and work great for staring at molten steel and light cutting but it's the arc flash that really gets you. I was kinda wishing I had a #5 shade after all of the cutting I did. Next time. Next time. About an our later I achieved some results. OOOOOOOOOOOOHHHHH baby gurlll! 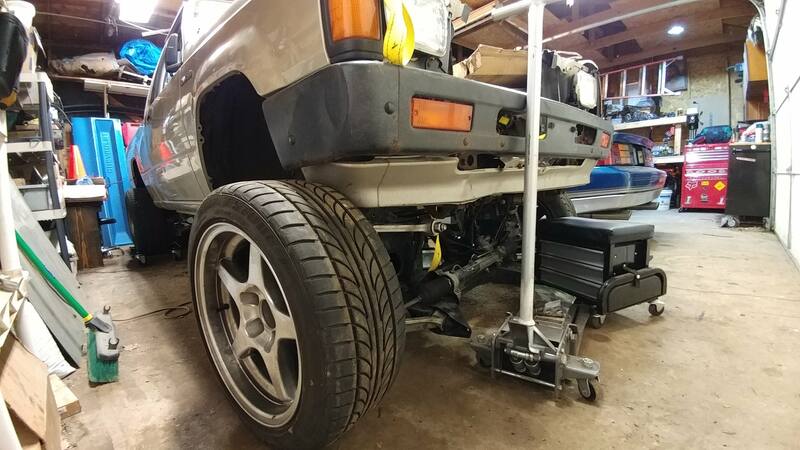 All it needs now is about 10" of body drop. 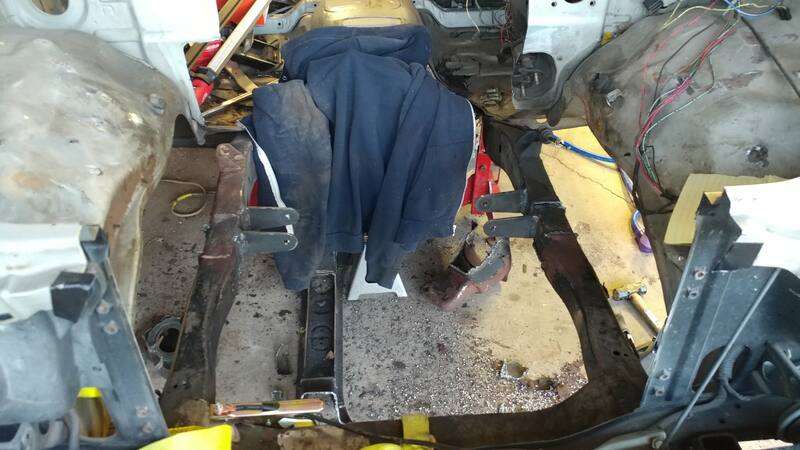 Upper control arm mounts lie directly in the middle of the frame rails. 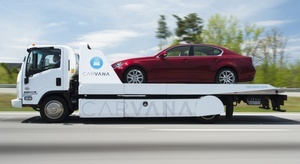 Once again I am interrupted by the narrow frame rails of this little truck. 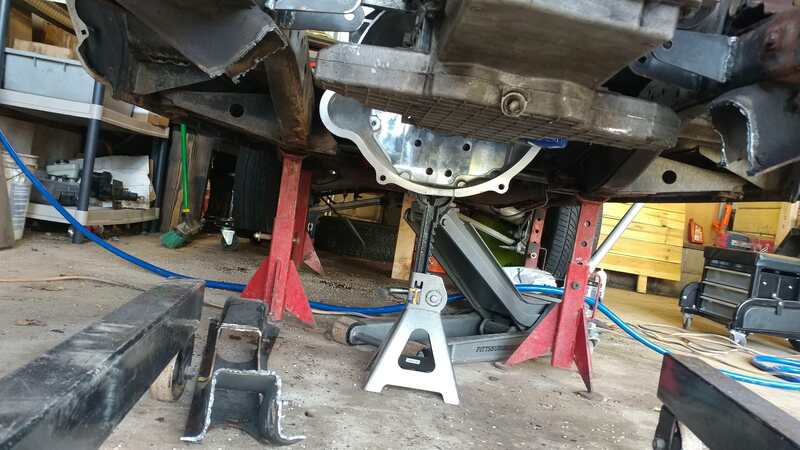 This is the general plan for the front suspension. Measure, measure, measure, measure some more and then when I think I've measured everything, measure it all again. I plan on just going a cut and paste. 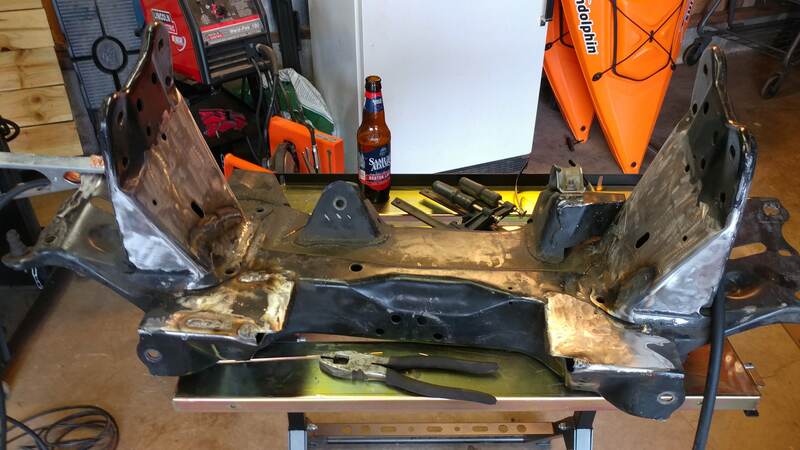 Cut the height of the frame rail out of the upper control arm mount, glue the rest of the subframe to the underside of the frame rails and then reattach the remainder to the top side of the frame rail. Lather, rinse, repeat, box and plate as needed. 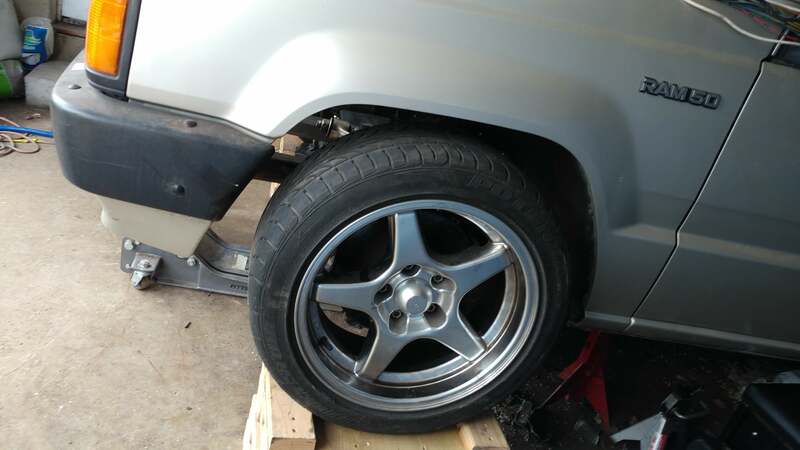 Granted there's more to it than that, I need to cut at the right Z offset to set my ride height. Patience and Sawzall will have to be used in the same sentence for this to work out alright. 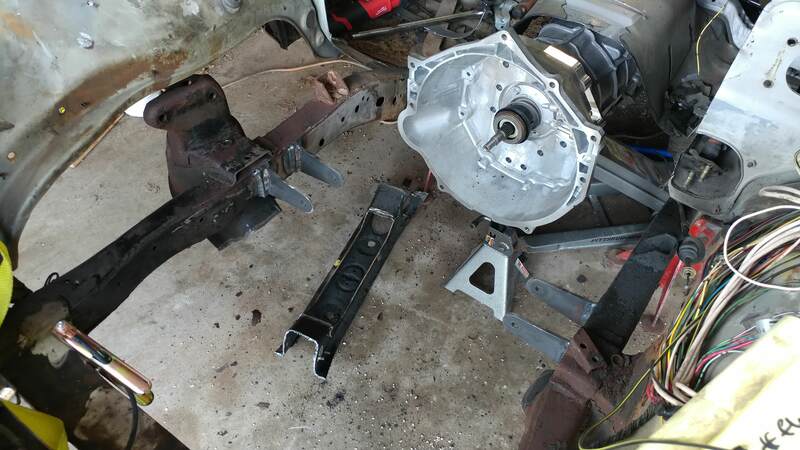 The front suspension looks like when I was putting the Mustang crossmember in my Toyota PU. Today was the first time I've touched the truck in nearly a month. 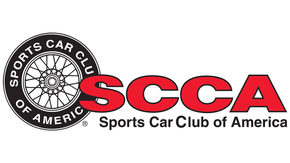 I spent the last three weekends at the Indy 500 and then a much needed road trip vacation with the girlfriend out west with a brief stop in Salt Lake City area for ST Octane Academy. 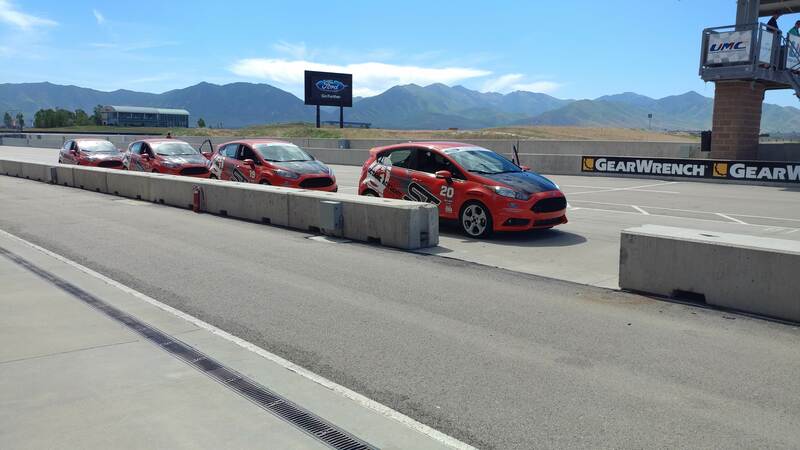 ST Octane Academy was a freakin blast, I really need to start autocrossing the Fiesta. Back to our regular programming. Did a lot of thinking about the truck while pulling the midnight shift through Nebraska on the roadtrip. 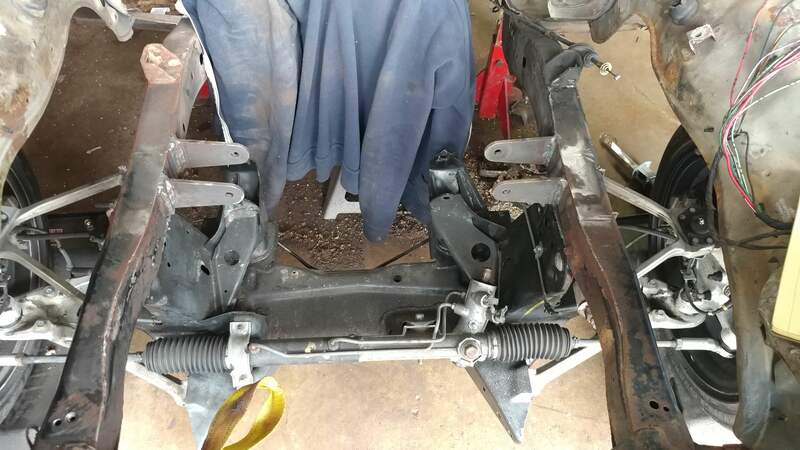 Something doesn't seem quite right about cutting the C4 subframe apart and hoping I can get it back together right. Berk that. 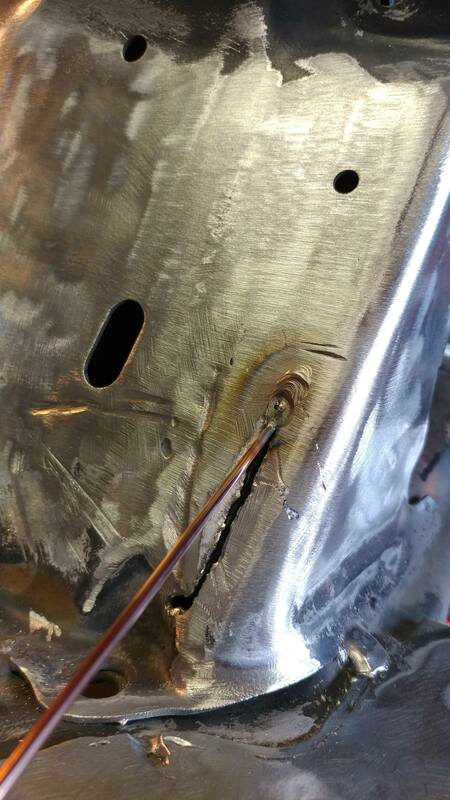 I'm damn good at cutting and welding tubes let's just do that. Steel is berkleying expesive nowadays. 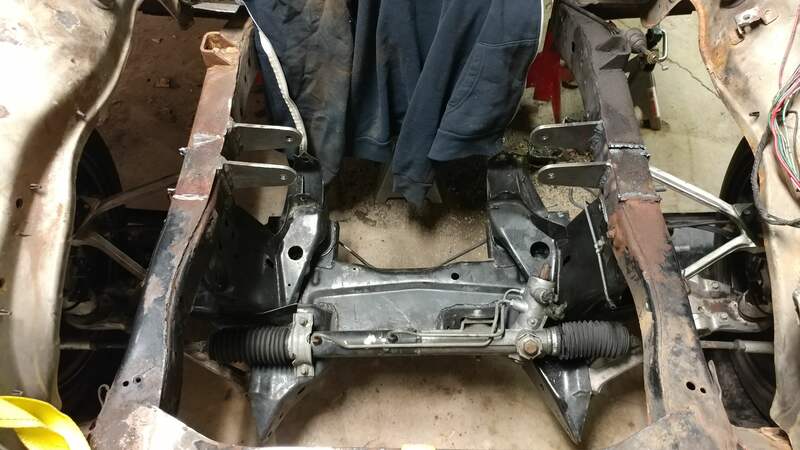 But here's the plan: brace the frame, support the front clip, chop the frame rails to allow the new subframe to find it's new home and then refabricate the front frame rails. Took a break to eat pizza and buy some oat sodas. 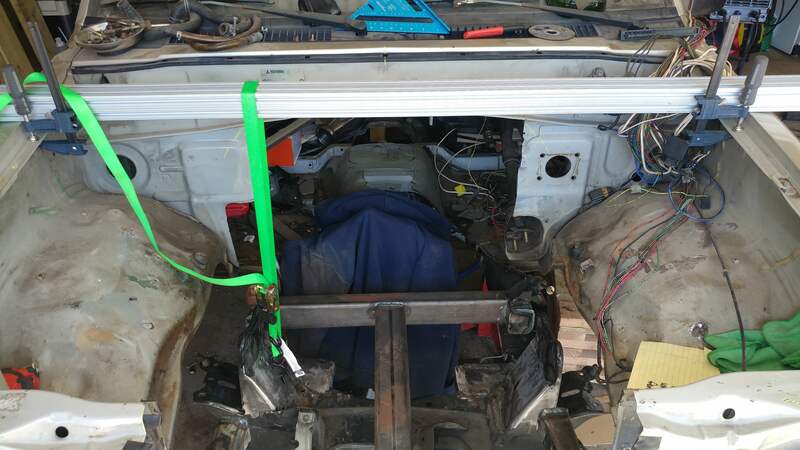 Going to venture back out to the garage to finish bracing the frame and then maybe sawzall surgery tonight. 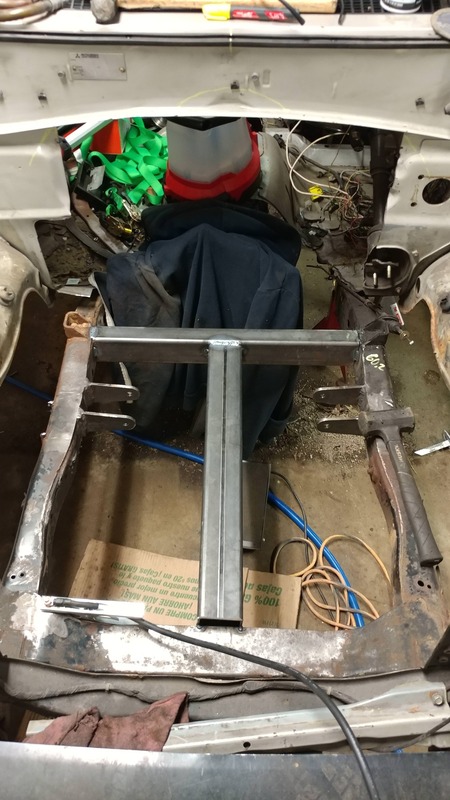 Welded in a longitudinal support bar so I can cut the two rails out and not have my front fenders turn into cooked lasagna noodles. 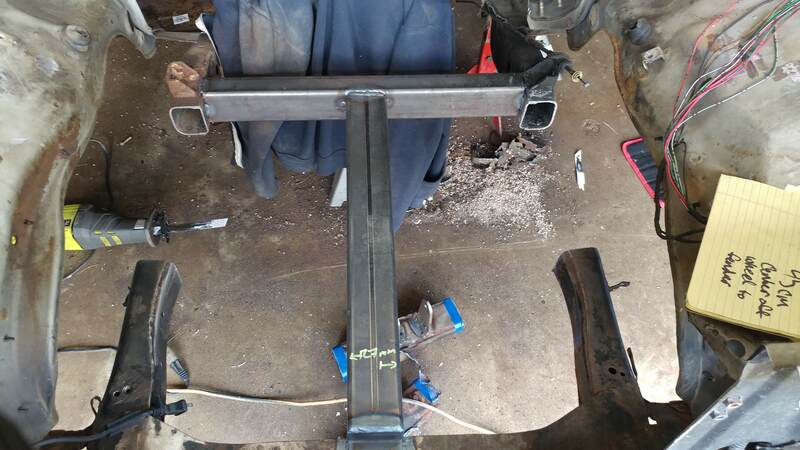 Going to brace the front tube to the lower rad support with a little bit of angle iron for piece of mind. Here are the projected cuts in tape. 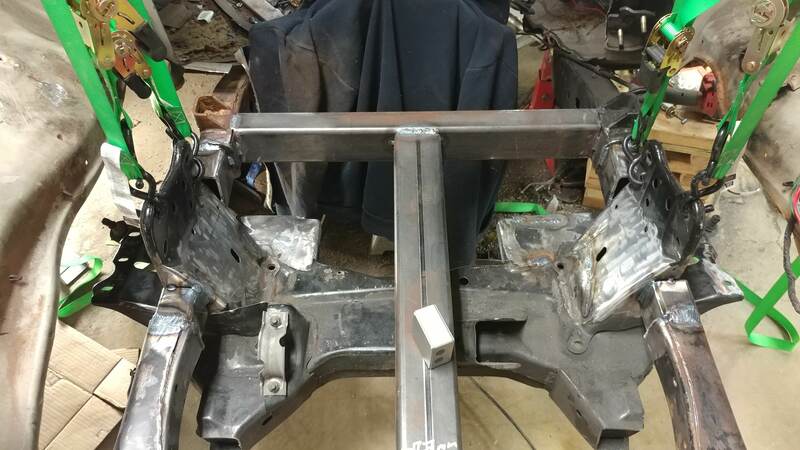 About 12" of frame will be removed, I am going to plate the ends of the the cut frame rail to give myself a nice base to weld to and work from when refabricating frame rail to the C4 subframe. 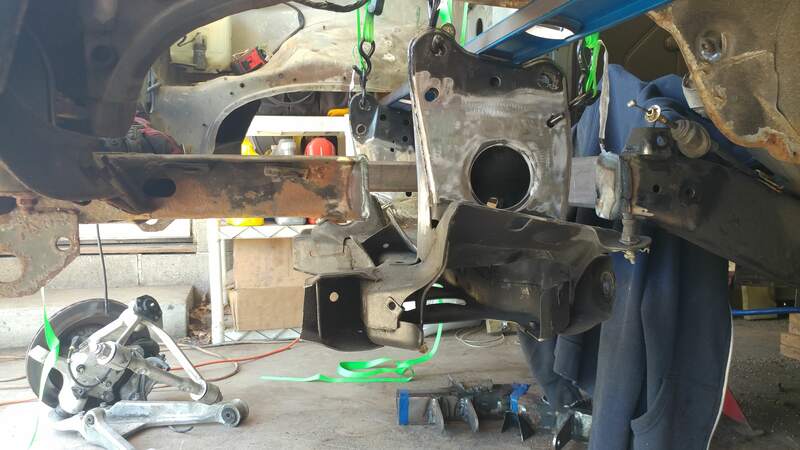 I need to verify the caster angle that GM baked into this subframe before I finalize fitment and also determine what I want the ride height range to be. 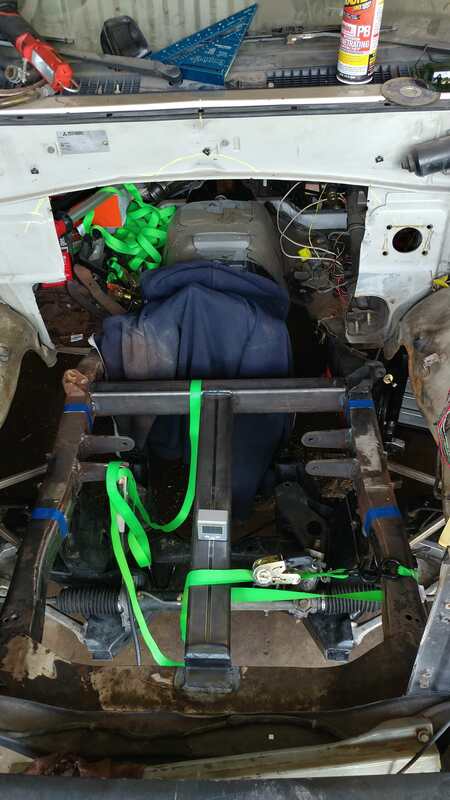 Had to get the angle finder and ratchet straps out to pull the longitudinal support into position. 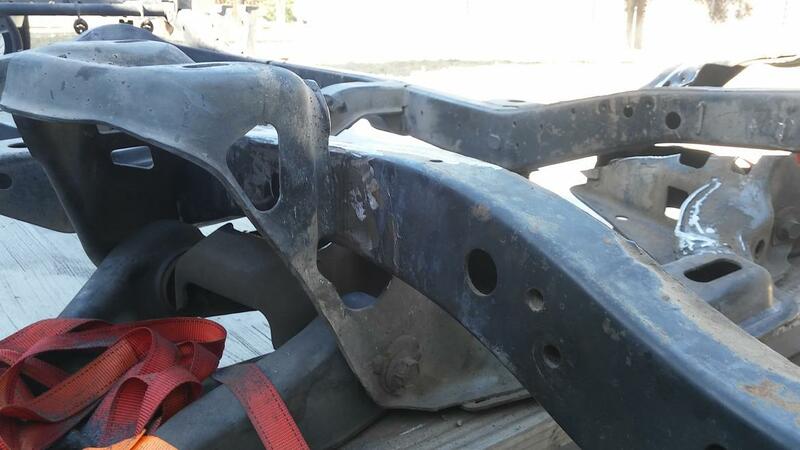 I plan to use this bar as a reference datum for aligning the subframe to the truck so I had to get it all scienced out. 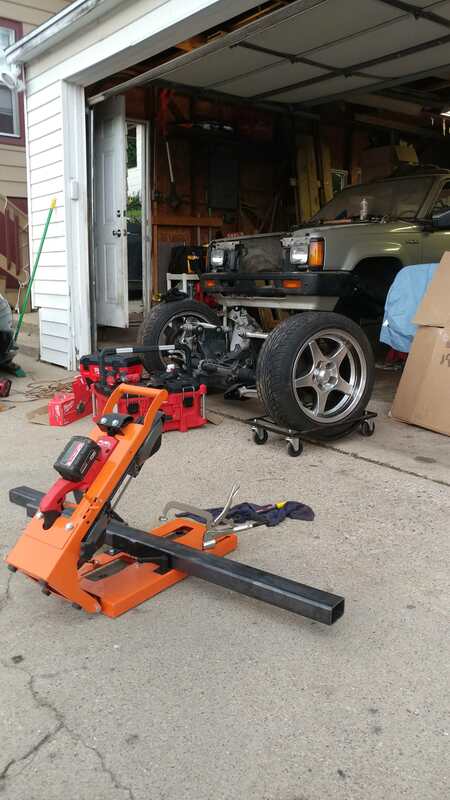 I haven't been this nervous with a sawzall since I cut the bellhousing off of my transmission. Cut like butter with a fresh fine tooth blade. Pleasantly surprised by the cleanliness of the interior of the frame rail. 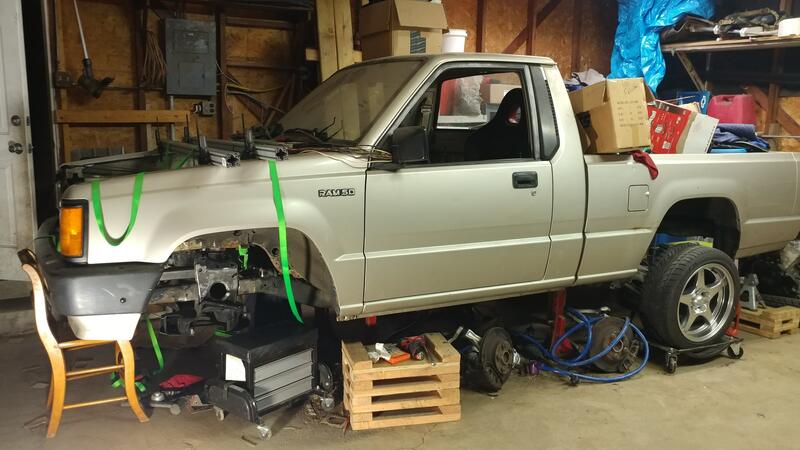 It dawned on me after a brief conversation with my roommate yesterday, who is a walking, talking, breathing Wikipedia page for useless truck knowledge, that the Mitsubishi truck may have been one of the few trucks of the day with a fully boxed frame and one of the only if not the only minitruck of the era with a boxed frame. 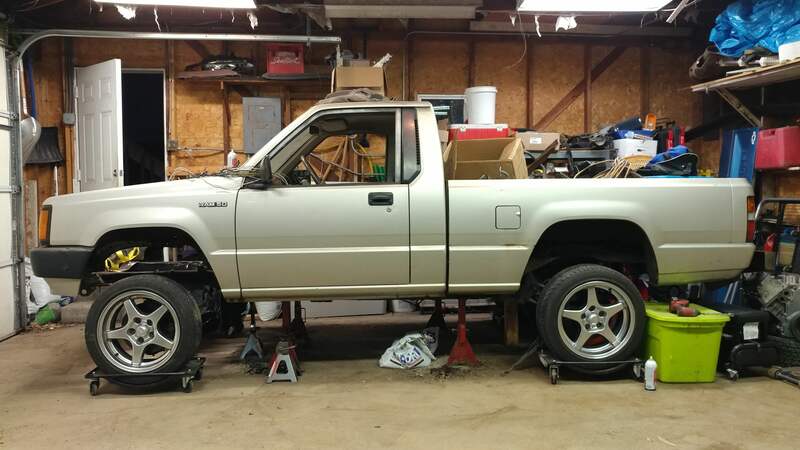 It appears I unknowingly picked one of the best minitruck candidates available to turn into Frankenstein's monster. 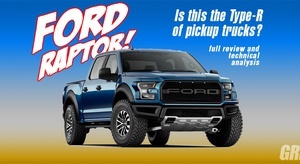 Hopefully the Frankenstein reference doesn't come full circle with the truck becoming a mindless killing machine. Would you just look at it?!?!? This shouldn't be too bad to build back up. Fenders will be necessary for this thing to not look like a 1:4 scale BroTruck. But damn this looks good. 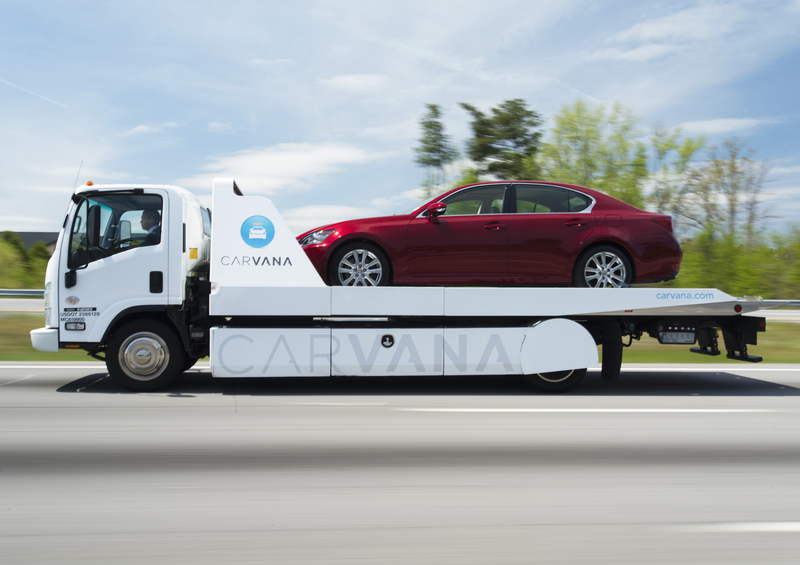 Looking like hot E36 M3, I'm really, really excited about this now. 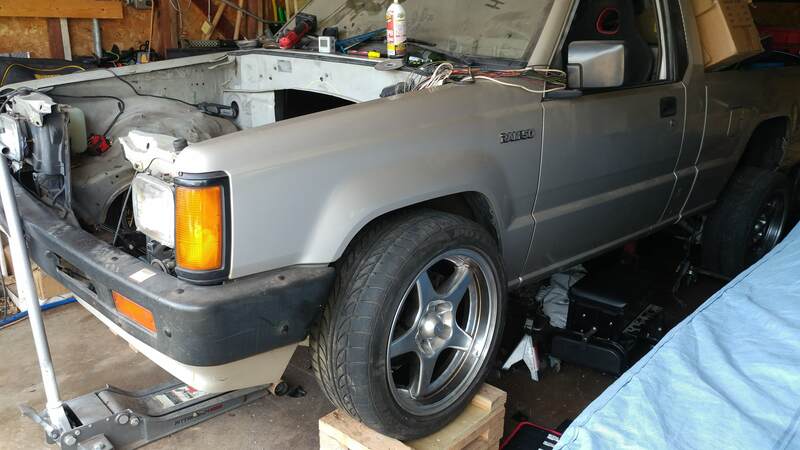 I am going to try and work on it after work this week to get the front suspension welded on so I can clean up and pull the bed next weekend and start on the rear suspension. 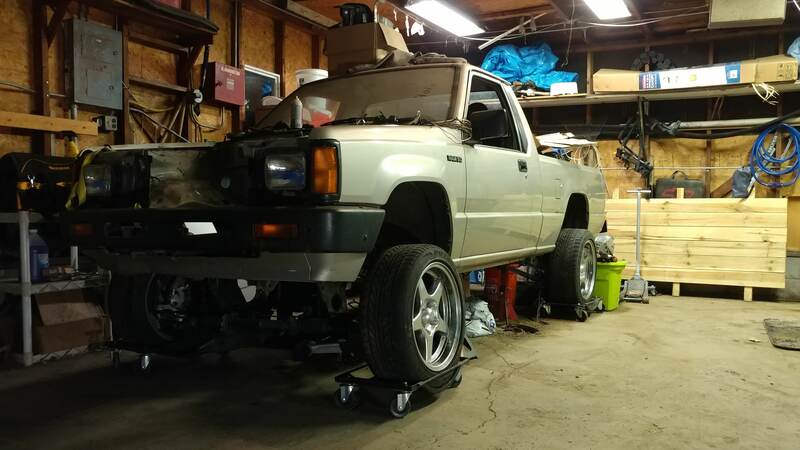 My 85 Toyota has a fully boxed frame and Im pretty sure its the same frame from 79 to the mid 90s. I can see why you did it the way you did, the Corvette cross member is much thinner than the Mustang cross member I used. I went ahead and just notched the member and left the frame alone. I stand corrected then. I read your thread and thought about doing it the way you did it but when I lined it all up and started measuring I realized I couldn't do it that way. 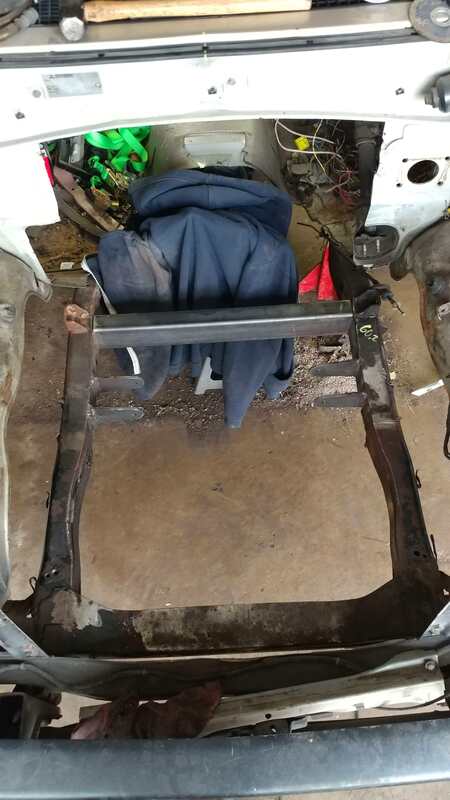 The frame rails of the truck are very narrow as well so it was either chop the upper control arms mount off and weld the subframe underneath the frame rail or cut the frame rail and position the whole subframe as needed. The latter option seemed more reasonable. 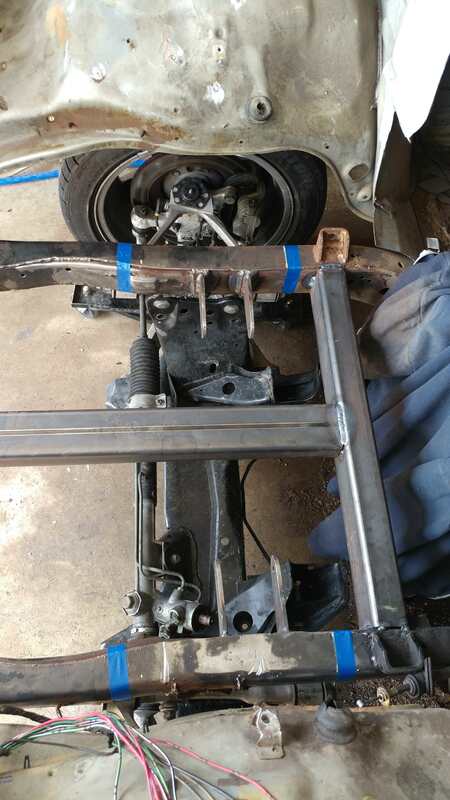 so it was either chop the upper control arms mount off and weld the subframe underneath the frame rail or cut the frame rail and position the whole subframe as needed. The latter option seemed more reasonable. you chose correctly. 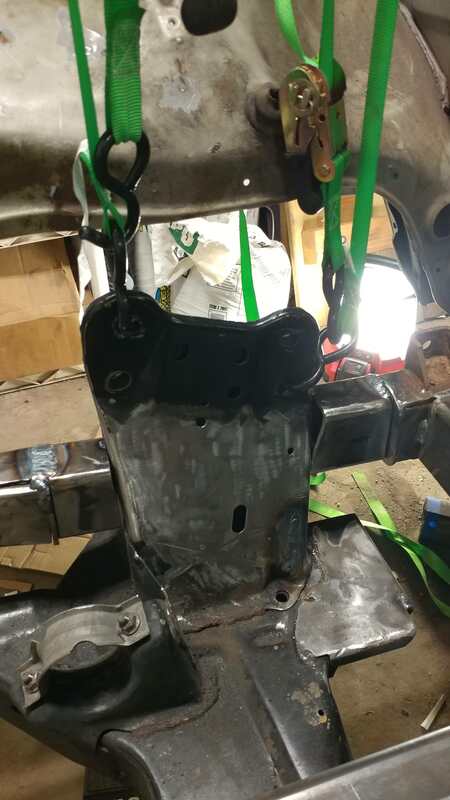 best to keep all suspension pickup points attached to their structure, and cut/paste the recipient vehicle to accommodate the structure. My thoughts exactly, the GM suspension wizards spent umpteen millions of dollars waving their wands over this suspension, why muck it up. 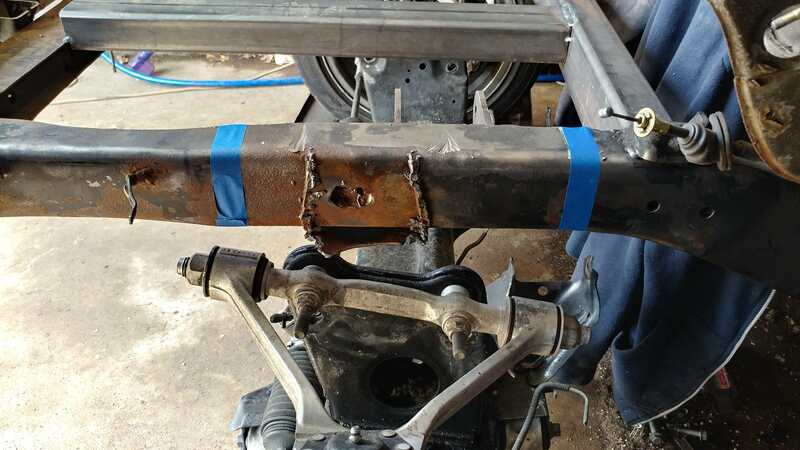 The only way the rails would have stayed untouched was to CAD everything up and have custom mounts laser and bent up to weld on. 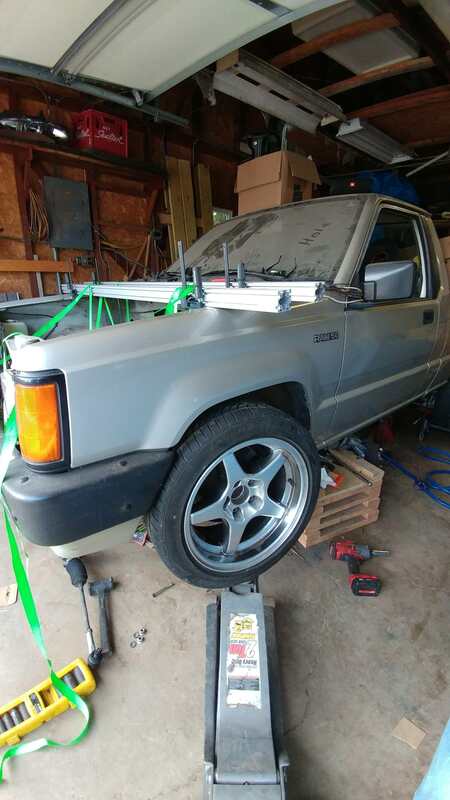 But this is a garage build not a SEMA car plus I didn't really want to do that. 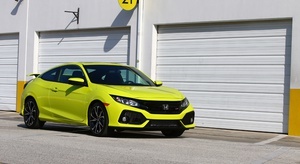 link to CRX cup holders? Thanks, I'm glad that you guys find my build interesting given the frequency of crazy builds on here. Ricky's Custom Extrusions on Facebook for the cupholders. 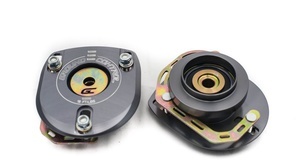 EF hatch cupholders are in the works currently, open to suggestions on other automotive 3D printing projects. Edit. 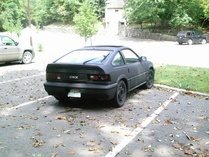 Updated with actual link to CRX cupholders. 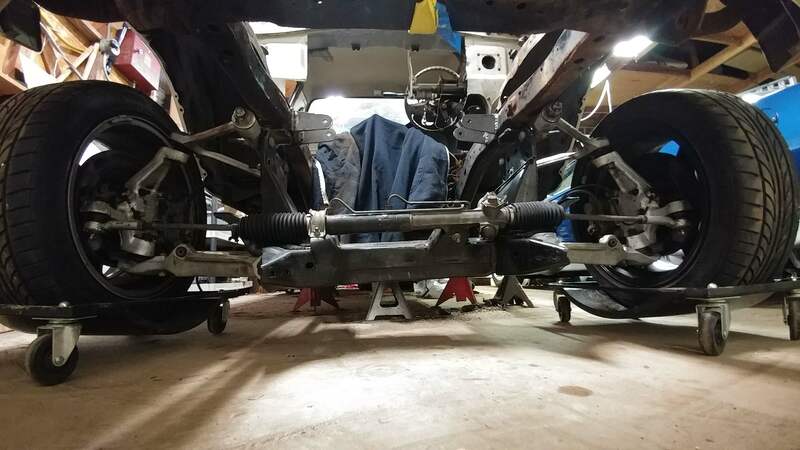 Strung up the subframe and took the wheels off so I could measure castor angle in relation to the subframe itself for a frame of reference. 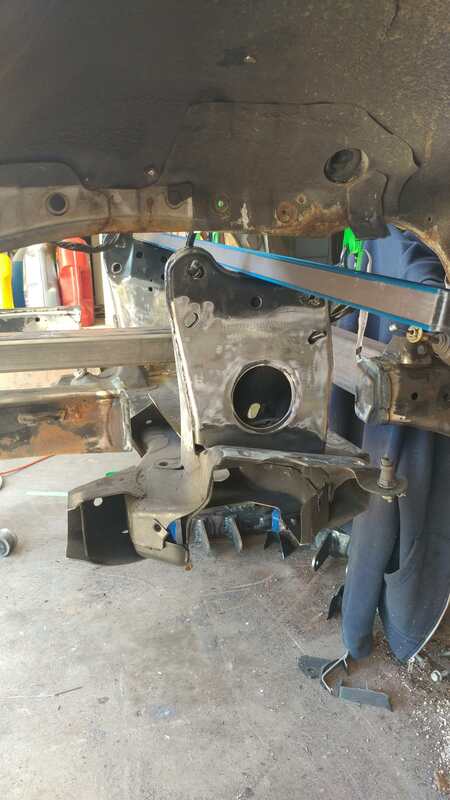 Plasma cut off the L88 engine mounts to clear the temporary frame bracing. 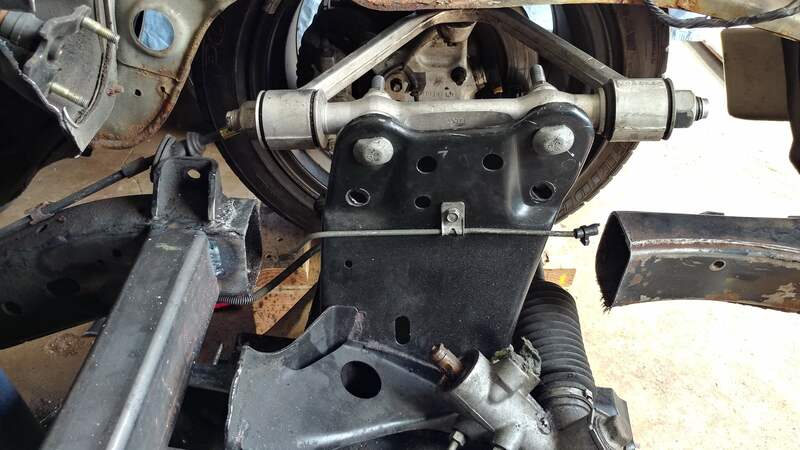 I'm planning a different approach for the engine mounts moving forward. Only ground down the remaining mounts on one side before the gearbox on my grinder was starting to scald my hands through my gloves. Giving it a break to cool down and figured I'd post an update. 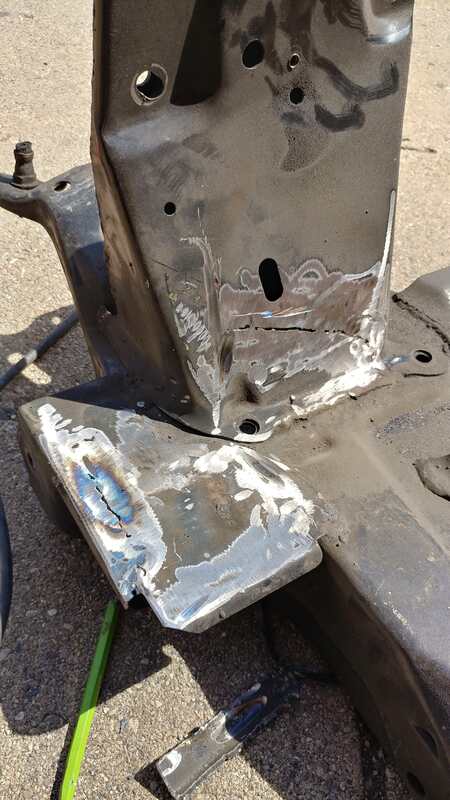 There are a couple spots where the arc of the plasma cutter bled through so it will need a couple touch up welds.. oh well. Spent most of yesterday working on my welders tan and trying not to melt my retinas. 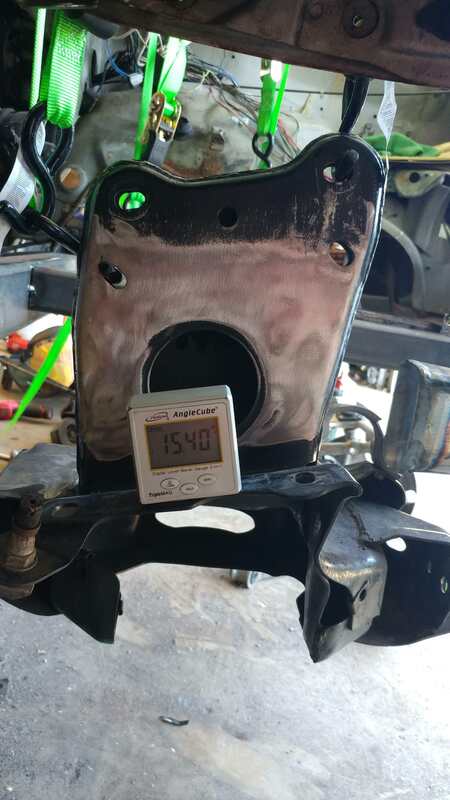 I forgot what it's like to tig weld dirty metal, the C4 subframe is now ground clean and the plasma scars have been stitched shut. 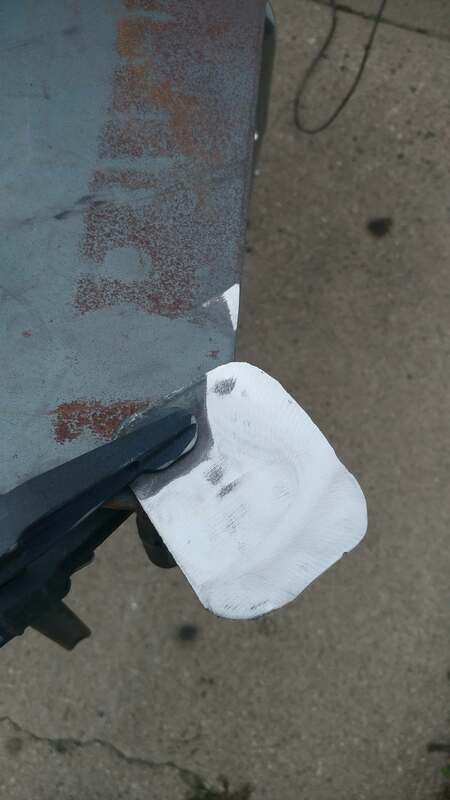 If you don't remove the etched on scale that the steel mill uses as a corrosion inhibitor you're going to have a bad time. 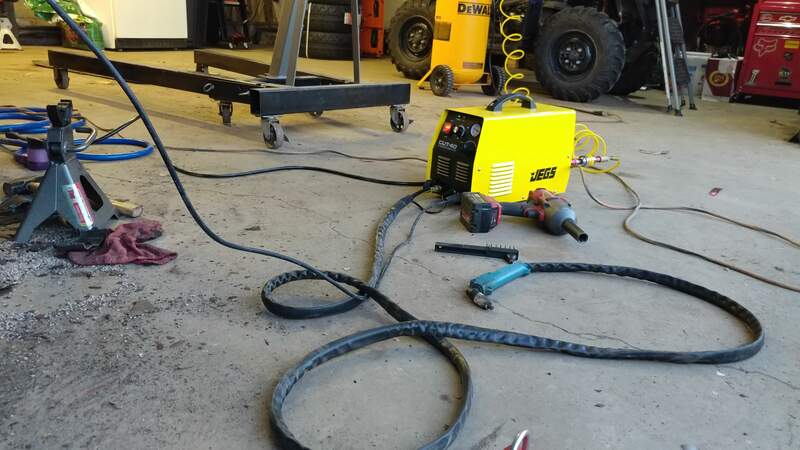 Partially welded in the plates and then one of my friends showed up with another welding project for me. 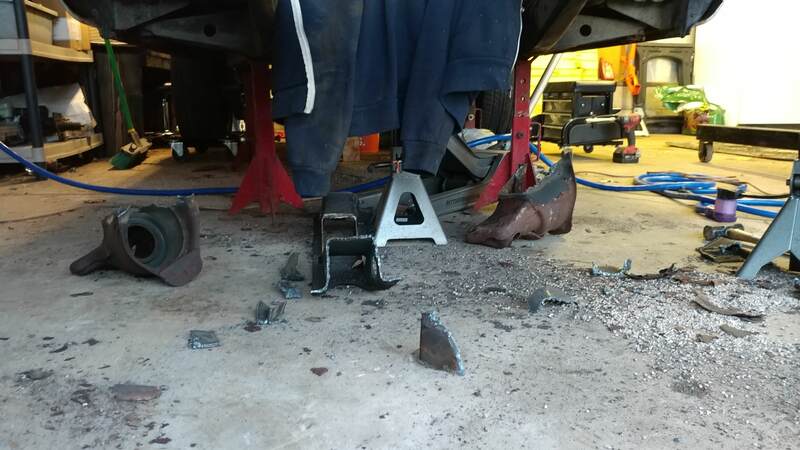 This side project involves metallurgical carnage, those with mechanical sympathy should look away now. Here's the back story on this. My friend Kyle, we know each other from work and school is kind of a traditional-ish drag race guy. 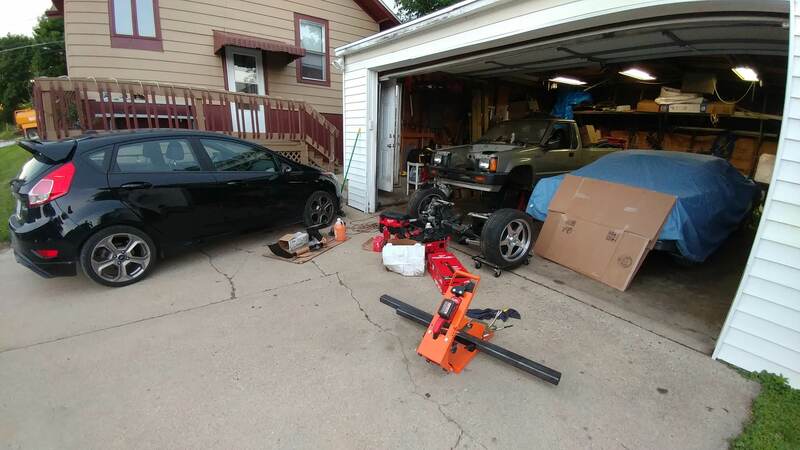 I credit Kyle and his Camaro for inspiring me to go with an LSx in my truck. 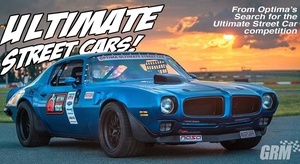 He has a fifth gen Camaro SS that was a LS3/TR6060 car, the engine got an LSA supercharger swap on it about 2 years ago. 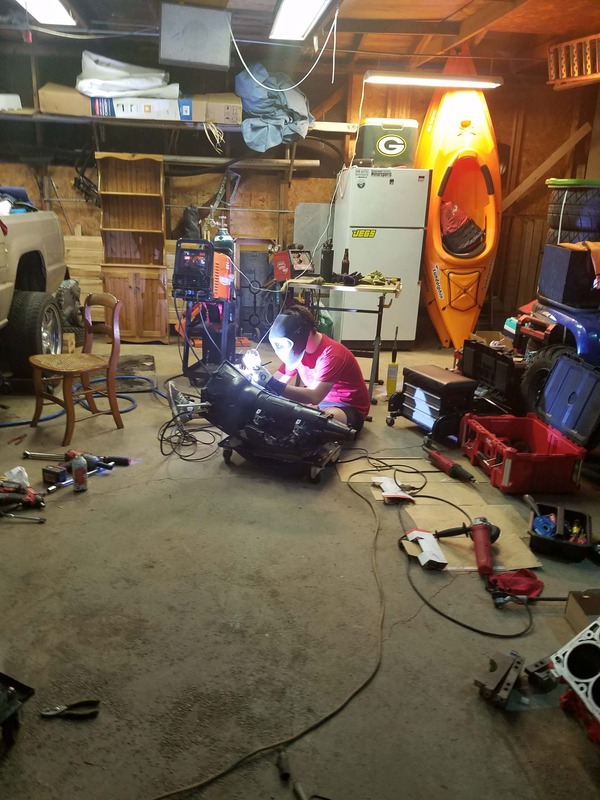 Kyle being the power hungry mother berkeleyer that he is decided that mid 600s whp through a 6 speed wasn't enough, the car is now getting a fully forged 6.2L, 4L80e and a big single turbo. Kyle has goals of a four digit power figure. 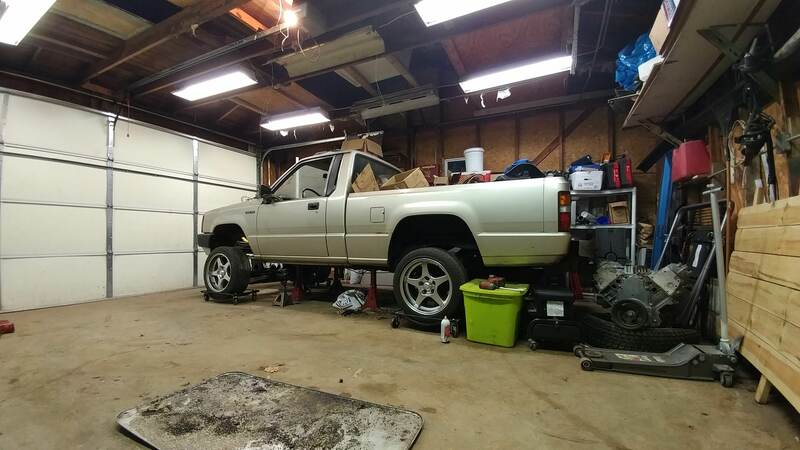 Some might call this excessive, he said he just wants to do wheelies and shoot fire balls. I can't blame him for that. 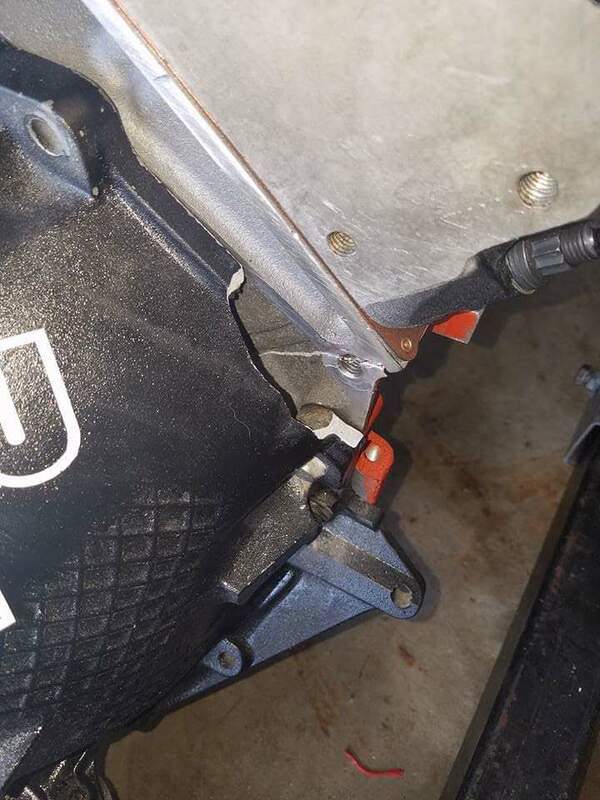 So to explain the carnage, Kyle was trying to get his engine and trans mated to drop in the car. They did not want to be friends, the trans got duck walked onto the engine and then an ear on the trans popped off. 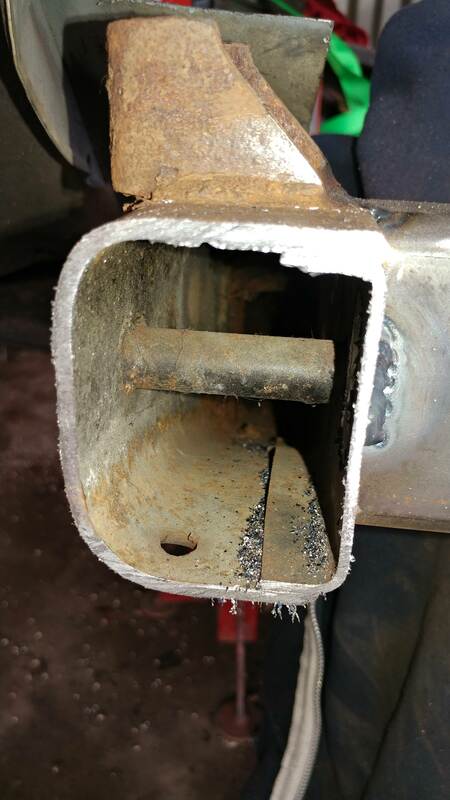 Upon further investigation the starter mount cracked off and there is a hairline crack on the drivers side of the block near a water jacket. 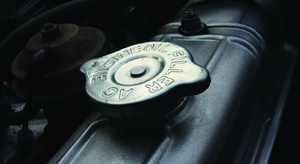 The dowel pins that were installed in the engine were found to be oversized, this interference fit and impatience were determined to be the cause. 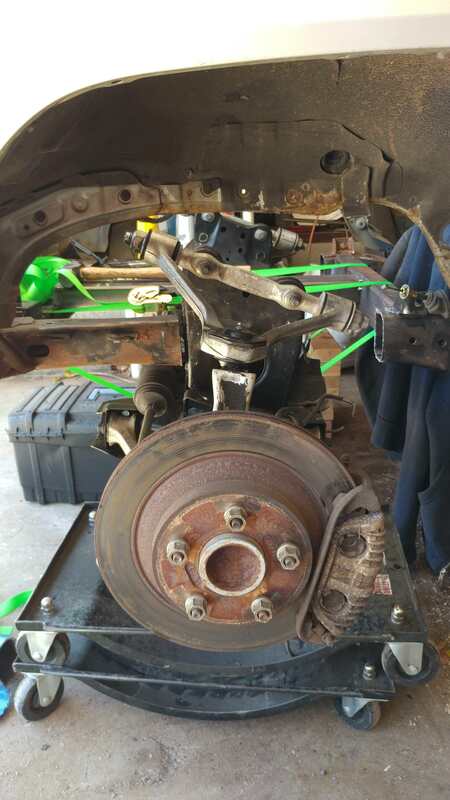 The lesson: If something expensive isn't going together like it's supposed to, take a step back, think about it and get the caliper out and measure it. 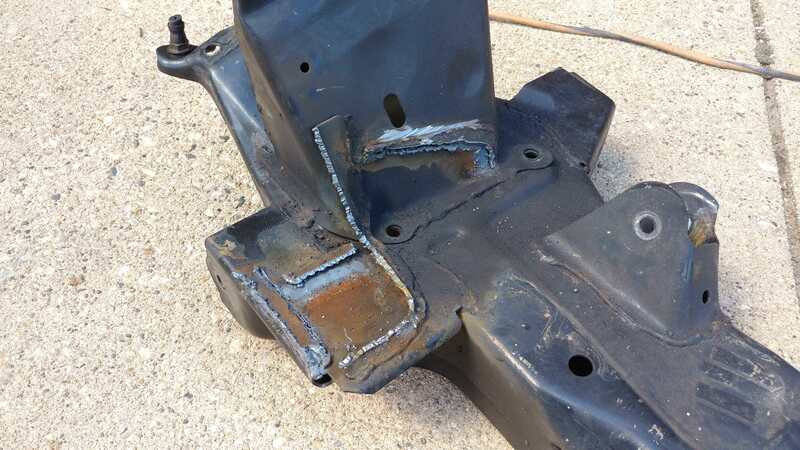 I offered my welding skills to stitch the block back together but with the power levels he is aiming for he wasn't comfortable with a welded aluminum block and he was looking for an excuse to go with an iron block anyways. 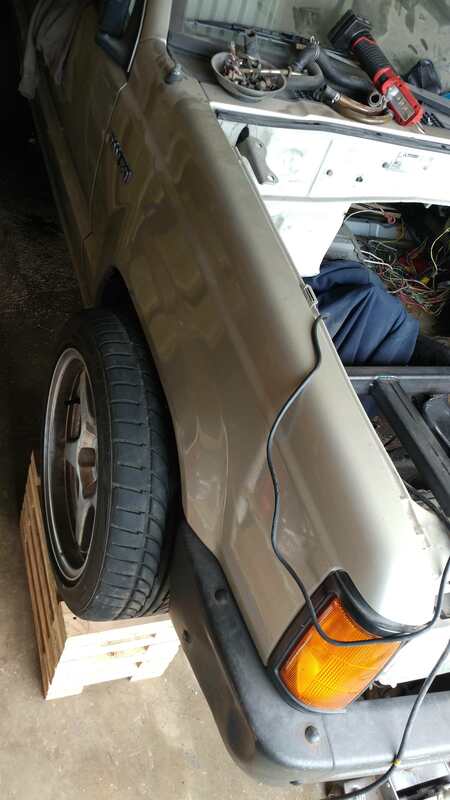 I managed to talk him into letting me try to fix the trans case though and offered the 4L80e I have sitting in storage as a backup. 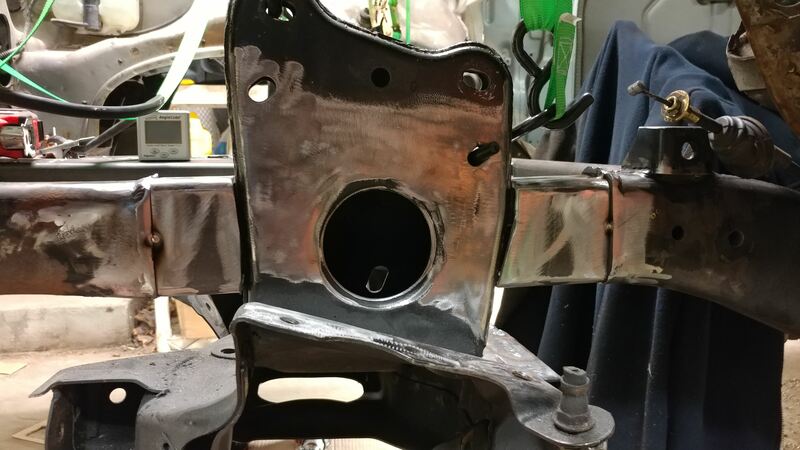 Not my finest work, the trans case was not a very inviting casting and I'm still figuring out all of the settings for AC on my welder but it should hold together. Before this whole dilemma Kyle had asked if I could help with exhaust work on his car after he got an astronomical quote from the local speed shop. I love doing exhaust work and he offered me red tools and alcohol as compensation, how could I say no. 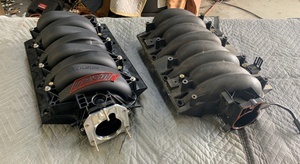 Given the progression of his build and his accumulation of Gen4 LS parts I'm now also getting a discount on LS3 heads, a L92 intake and a cheap LS3 block that needs some electroshock therapy. 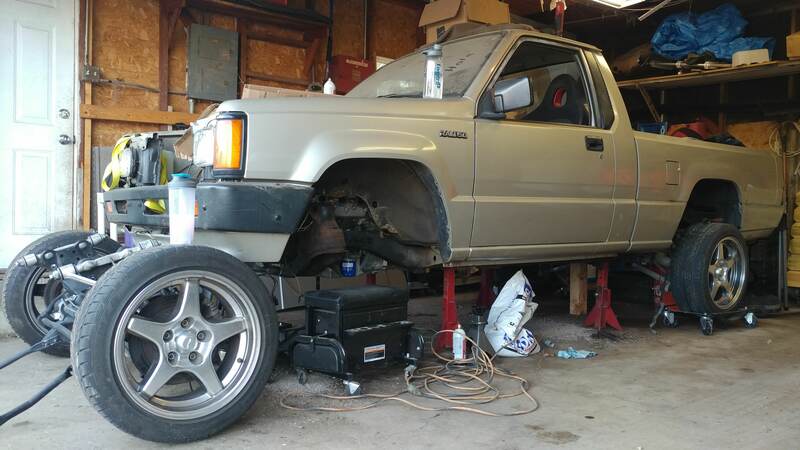 I'm still going to use the 4.8 to get the truck running and shakedown the chassis. 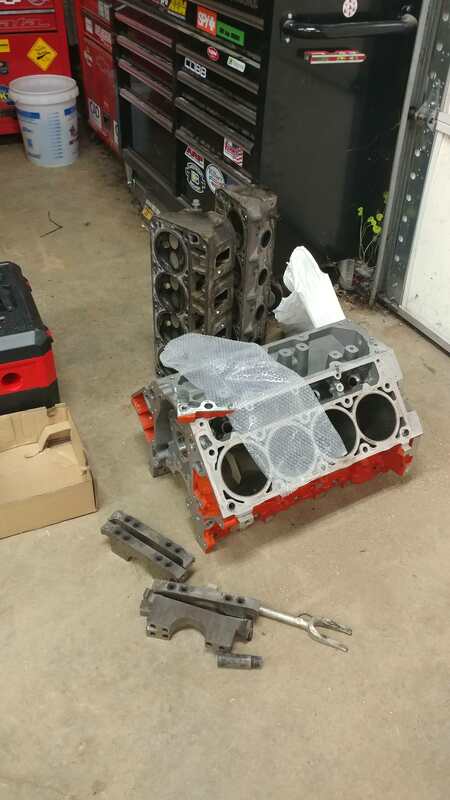 I plan to repair the LS3 block and then do a rather unconventional build with it. 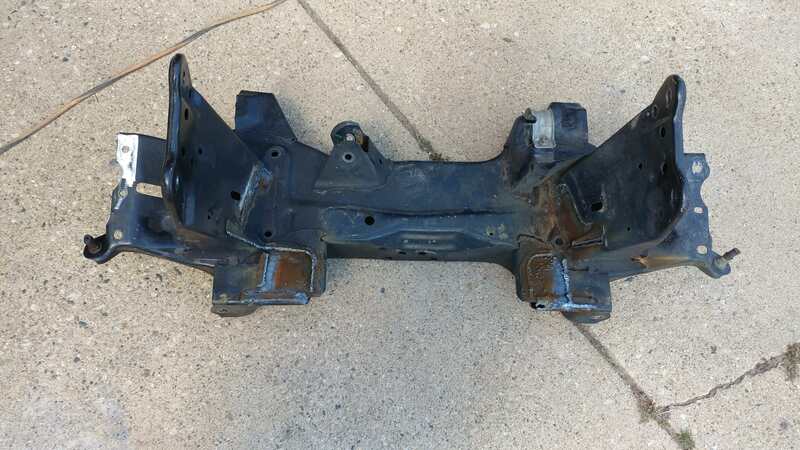 I plan on using a 3.267" crank from a 4.8L truck engine, the stronger Gen4 4.8 connecting rods with a floating pin piston from a L92 (flat top with 3cc of valve relief) and the rectangle port heads. 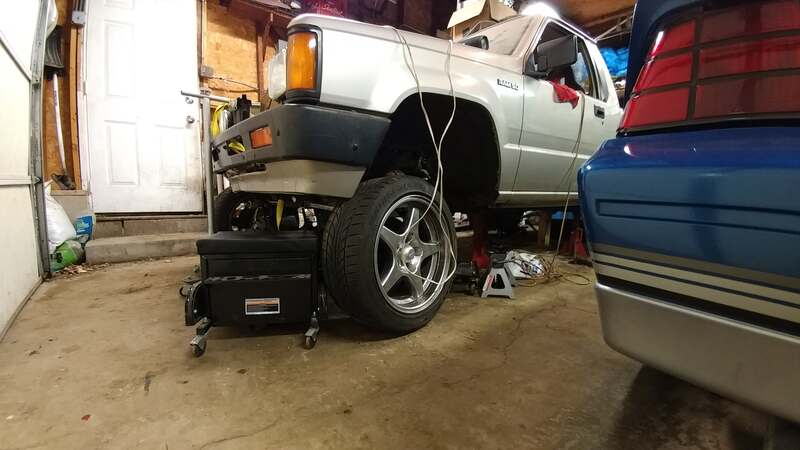 According to my math and the Summit Compression Ratio Calculator this combo should yield a 9.5:1 compression ratio and a motor that should have no problem making +700whp with a large inhaler or 500ish without forced induction. I spent the better half of 2 hours rigging this up and measuring 8 point and 4 angles. 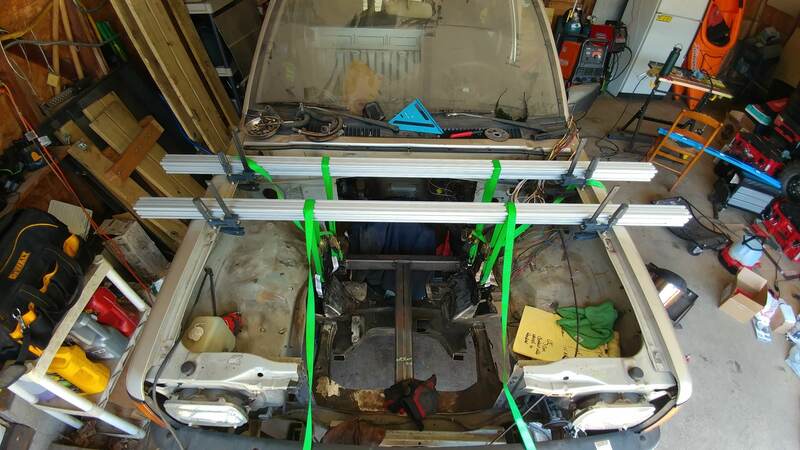 Move one beam or ratchet strap slightly remeasure everything. 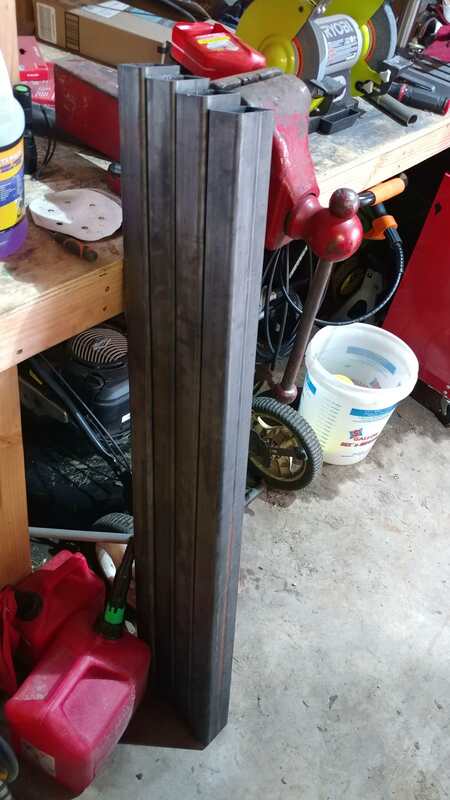 Move the same beam the opposite way slightly less, remeasure everything. 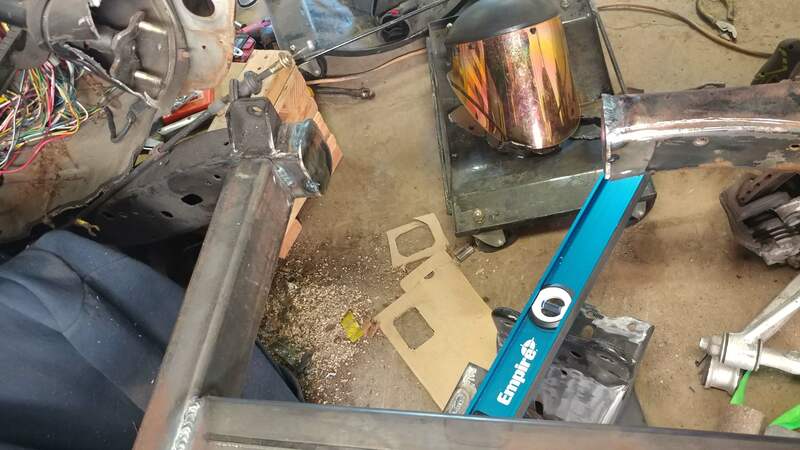 I had everything set perfect, I was sitting underneath the drivers side fender, I got really excited that everything was perfect and stood up right into the corner of one of the 8020 beams. I managed to scrape some hair off of my scalp but nothing major, I was more pissed I had to remeasure everything again. 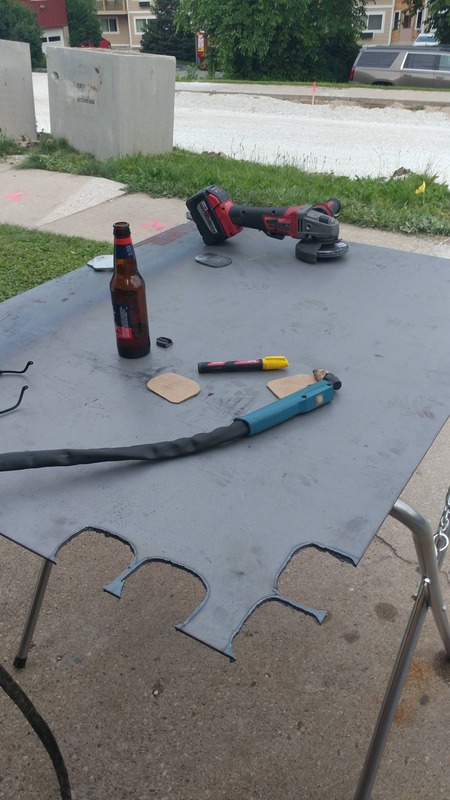 I had just told my girlfriend, who is perpetually concerned about my ability to casually maim myself, that it's not metalworking until you hurt yourself. Open mouth. Insert Foot. I have an inexplicable fondness for this brand of angle cube. Maybe I'm just overly familiar with it. I built 3 SAE Baja Chassis with one of these, a drill press tube notcher, a 4.5" angle grinder and a Miller Diversion 165. 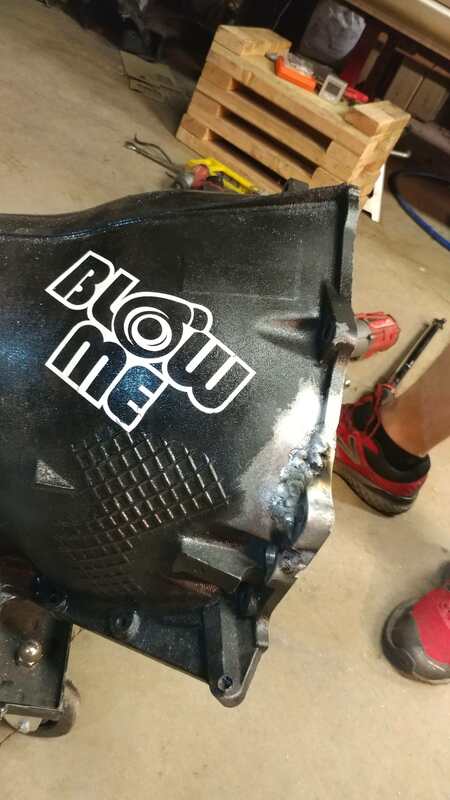 It's not fully welded but it's in there like swimwear. I can't find words for how awestruck yet horrified that something might be wrong that I am with this project right now. 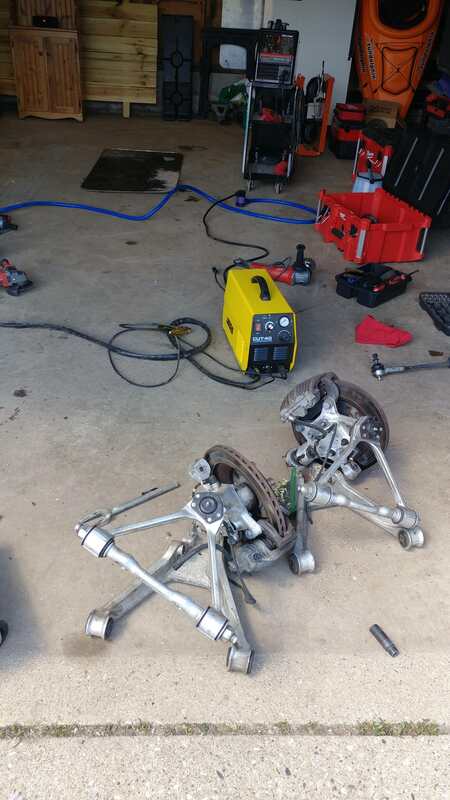 I'm going to bolt the suspension back on and cycle it a few times before I finish burning it in. 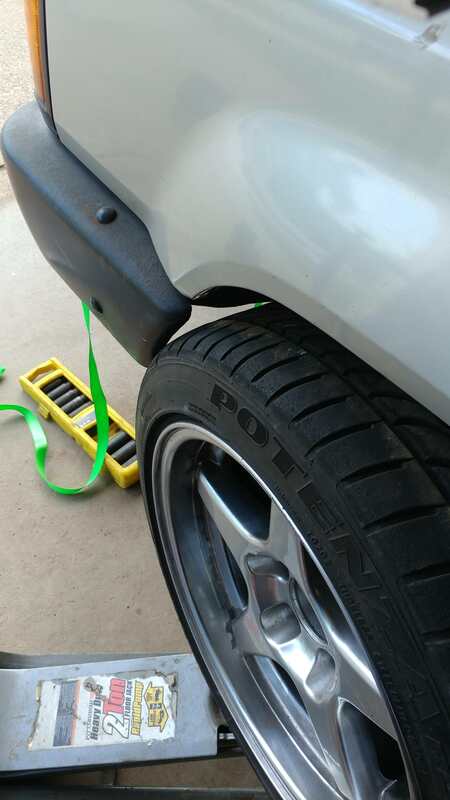 I just want to double, triple and quadruple check the fitment of everything before I can't go back without torching the whole damn thing out again. Where it sits now if I need to move anything I can make a couple relief cuts with the sawzall and hammer and shim it into position. I hope it doesn't come to that though. But Holy Berkeley is this cool as E36 M3. I've recently come to the realization that I have had this truck for nearly 3 years. 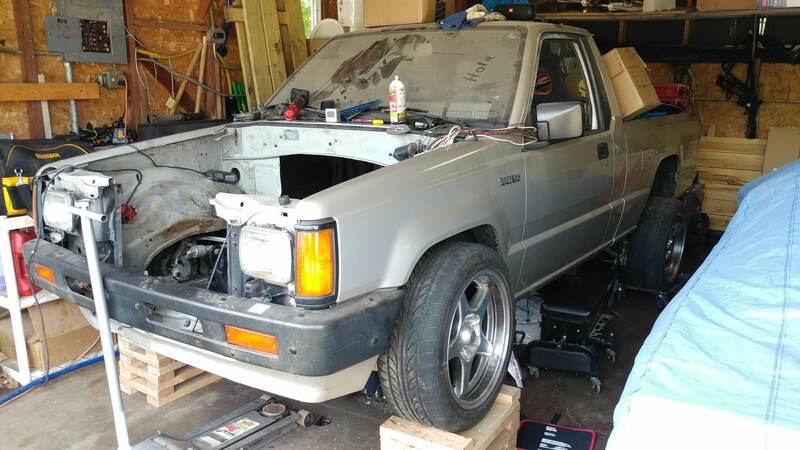 I found the date that I bought the truck was 9/13/15 after digging around on my Instagram account and my google photos album. I took this picture the day after I bought the truck. 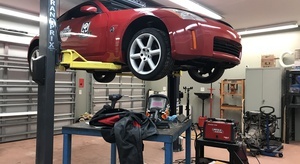 The local speed shop that specializes in late model Corvettes, Camaros and LSx swaps is holding a dyno shoot out and car show the fourth weekend in September. I have no intention of putting a naturally aspirated 4.8L on the dyno in the midst of force fed, high strung V8s. But I do think having a set goal and timeline will help with my procrastination. Also, it is a pretty fitting venue to first get the truck out and running for it's 3rd anniversary with me. 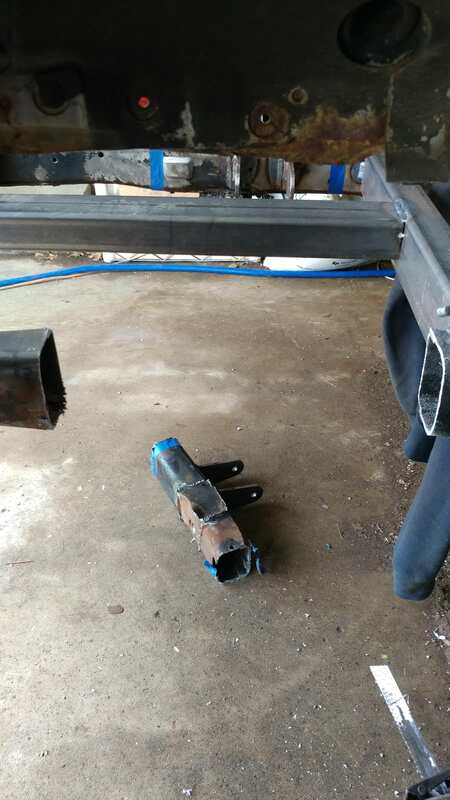 Did some more welding on the front end today after test fitting the front end. 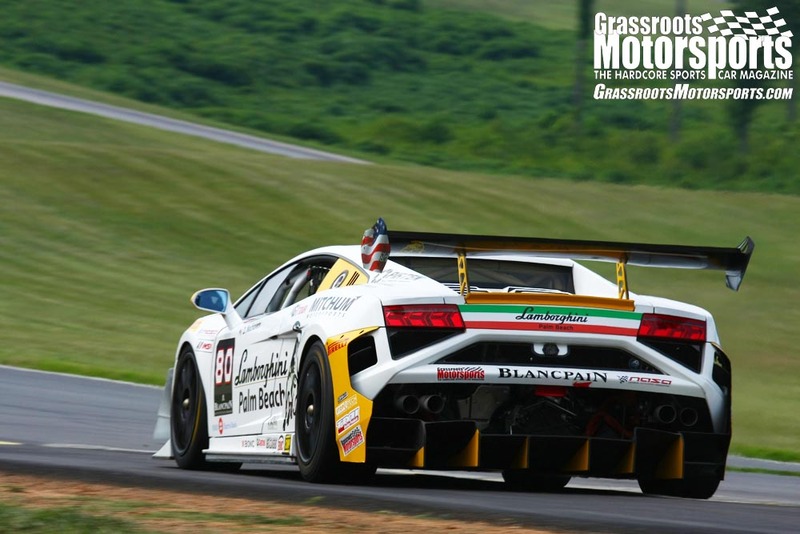 There's so there's some interference with the front bumper, the tires clear the fender for the most part though. 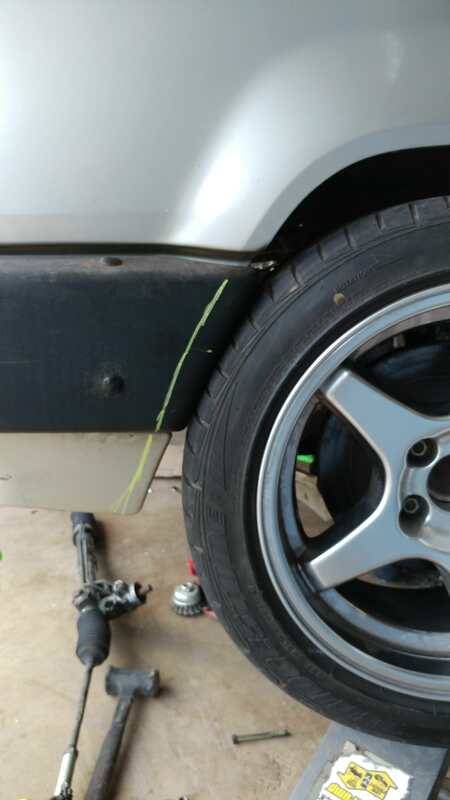 A little trimming will be necessary. love your project. 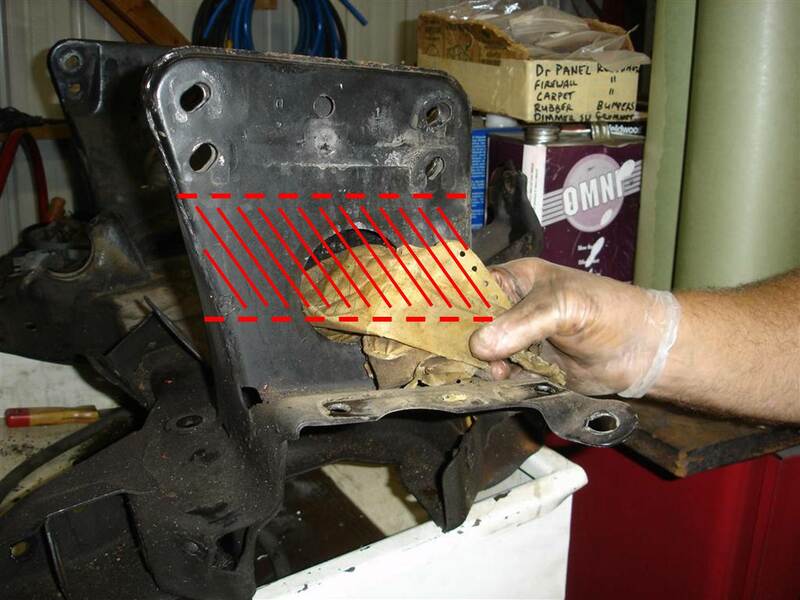 particularly the incorporation of IRS, too many do drivetrain swaps and neglect the rear axle. Thanks for kind words. I love your take on the VetteKart craze.